Last week I showed you how to clean your bathroom in 2 minutes. My readers went crazy for this, as it is so easy and ALL moms can do it. Today I am going for the big guns…the kitchen, in 10 minutes or less. Mop/Swiffer/steam mop/something to clean your floors, quickly. My kitchen is large, very large and it is the central hub to our house. It is where EVERYTHING ends up from the vehicles, where the mail goes, where the dogs eat, where we cook and eat and it gets filthy on the daily. So keeping this area of my house clean is essential. 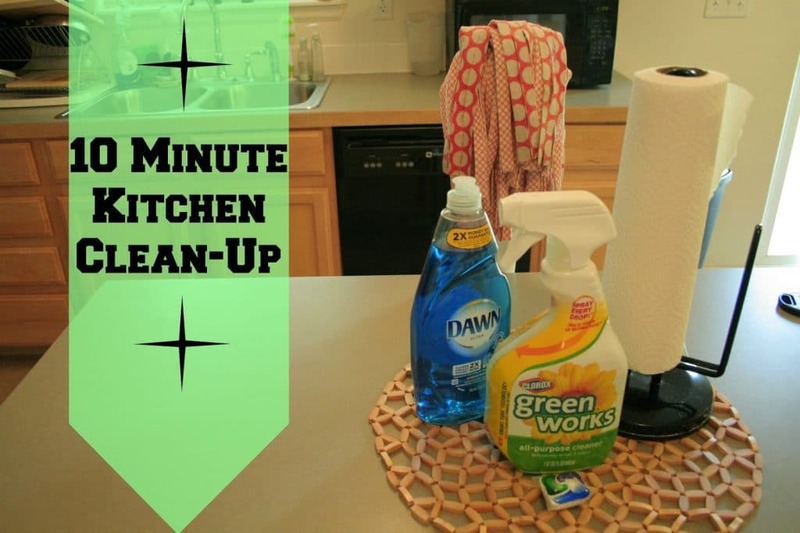 I clean my kitchen usually after dinner every night, while the kids and hubby are finishing dinner (I tend to eat quickly) and by the time the kids have fed the dogs all their dinner, I am usually cleaned and ready to relax. I HIGHLY recommend cleaning your kitchen at the end of the day, after you may have prepped 3 meals and destroyed it like we do. Pro Tip: Set the timer on your stove for 10 minutes. Whatever you get done you get done. You will get quicker and get more done, and its fun to have a little race. 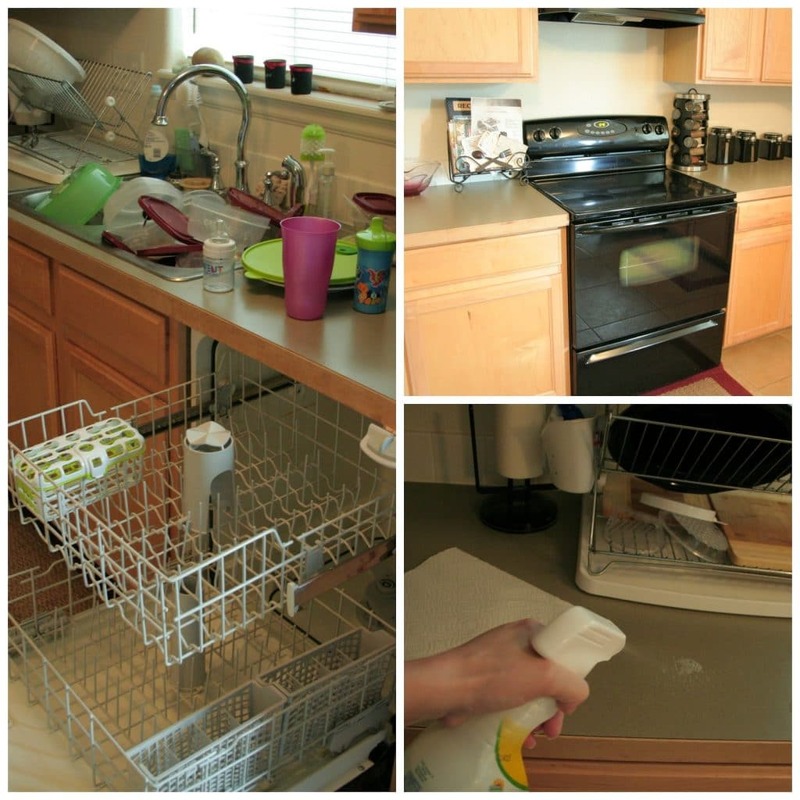 Unload and reload the dishwasher (4-5 minutes) Hand wash any pots and delicate dishes. I use a scrub brush and dish soap under running water to do this, instead of filling up the sink. It is quicker and because the water is running I tend to move much faster to save water (at least that is my mentality). 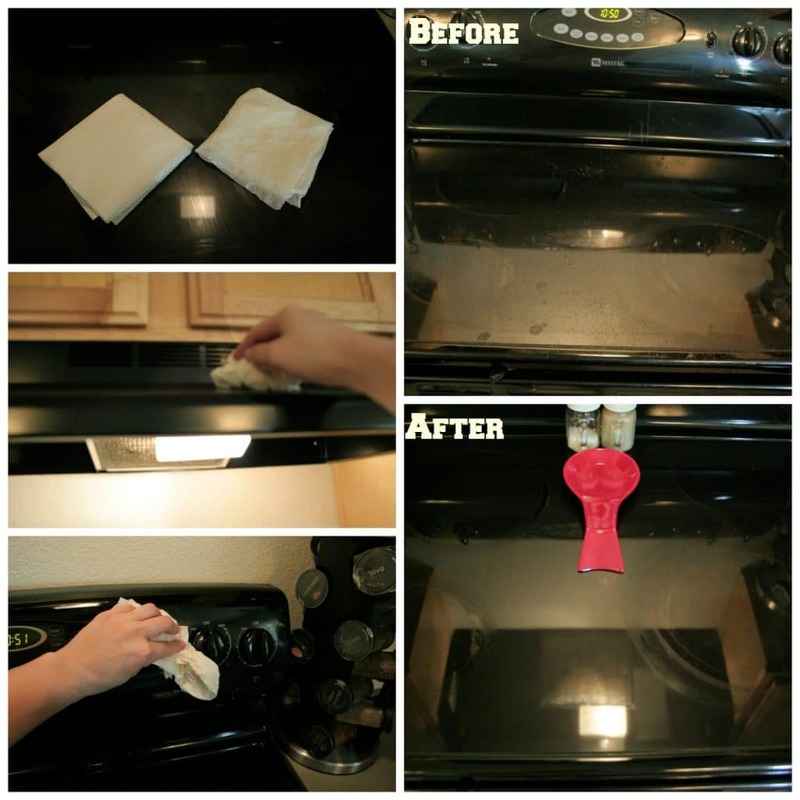 Clear counters and wipe them down (2-3 minutes). Like I said before the kitchen is the central hub, typically I am moving toys, crumbs, mail, dishes, and who knows what other junk we accumulated that day. I start by putting away any food that we just prepped, then I move toys back into the toy bins, put the mail in our sorter and dishes in the sink. I totally forgot a picture, but with 2 hairy dogs, a baby that is more of a crawler then a walker and traction through that room more than any other, the kitchen floor gets disgusting every day. I usually leave this for the last thing, because sometimes it just does not fit within my quick 10 minute time frame, but most times it does. I will quickly sweep (not perfectly) and just get the major stuff, and then I just grab the mop/wet swiffer and go to town as quick as possible. It is not always pretty, but it helps cut down on the gross, sticky, hairy floors and makes the deep cleaning days go much easier and faster. My counters are never fully clear, but they are always functioning for what makes our life easy. I keep my cleaning supplies at the ready and easy to grab, our dogs need water and I hate carrying the dishes to the sink so instead we use this broken pitcher for their water and I always keep bug spray and sunscreen next to the backyard door so that I can quickly grab them when my kids decide on a whim to run outside. Our space works for us and is functional for us. In keeping your house clean it is really important that you keep this in mind. I work with the common known mindset that everything has a place (coincidentally this drives my hubby nuts because I am always moving things to their “place”). Nothing stays on my counter tops longer than a day, I always find it a home and that really helps to keep my kitchen clean. If you manage to have extra time left and have whipped your kitchen into shape, grab a disinfecting wipe and wipe down those common touch areas (light switches, door knobs and handles, cabinet doors, and other areas). If you are interested in my doing a a deep cleaning series, please comment below. I will tell you that those usually take me about an hour/room, but they are seriously in depth. Do a deep cleaning series please  I would love to read it!!! What does your mail organization look like? And yes to deep cleaning series! Angela our house has built in shelves for organizational purposes. Jason gets the mail and puts it on the table. I sort it by bills, important docs, coupons and junk (trash). The bills and important docs go in the top shelf and the coupons go in the bottom shelf. Once a month I pull all the bills and important docs and pay bills and then I file them according to what bill they are. I also file/put the important docs in our safe. Great ideas again! Thank you! Thanks to my favorite blogger! yes its good tips thanks for shearing Trustworthycleaningserv provide customized Detail, Regular, Basic, Post Construction clean up, Move out & in cleaning, Office, Window Cleaning. I will ask my maid to read this post. Just kidding. I like green cleaning stuff, so I'll look for Green Works. How about I take the pictures while you deep clean my space? Just kidding. These are great little posts. Sometimes I just need to see that its possible! My counters are always overflowing with stuff and I need to get much more organized. 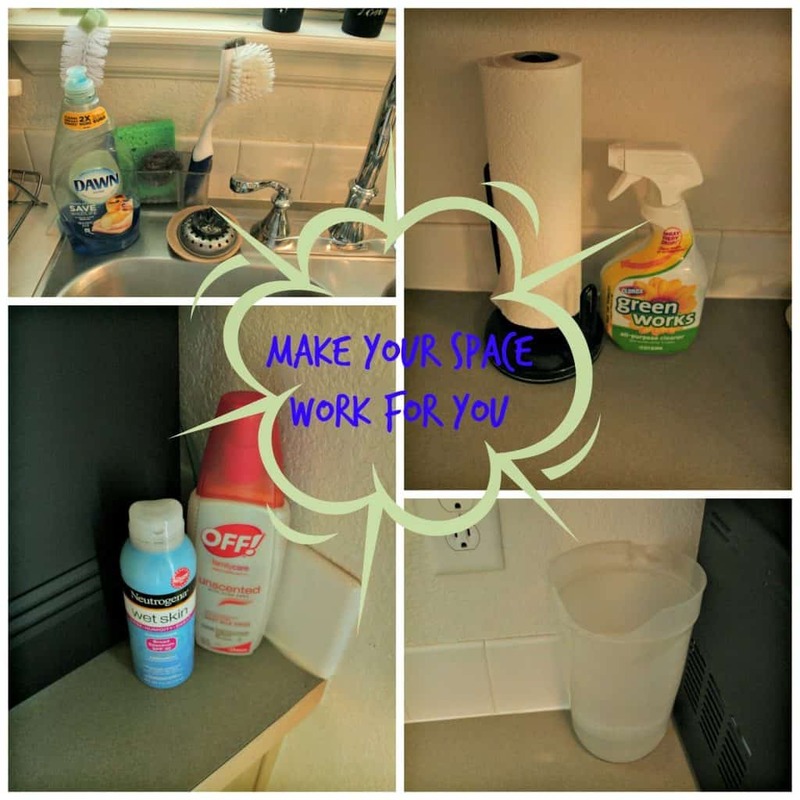 Love your cleaning tips! Thanks for linking up to The Creative Exchange Linky Party! 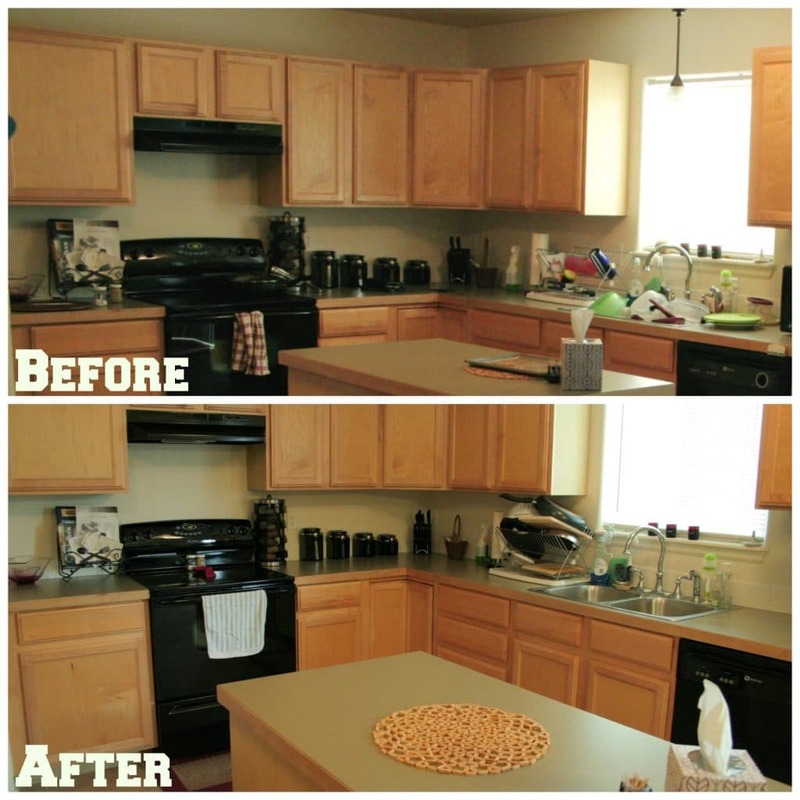 Love the kitchen cleaning tips!